We offer Passover education and observance for all ages at our temple. See below for opportunities to join us! Our popular members-only seder returns! Join us as we celebrate Passover with Temple Beth Shalom members and their families. We will read the Haggadah, sing songs, eat a potluck meal, and have fun together! Seating is limited, so RSVP now. Join Temple Beth Shalom at our annual Tot Seder! Geared for families with children ages 0-6 years, this is a lively and interactive experience full of songs, movement, and fun. After the Tot Seder, we'll taste seder foods and schmooze. Free and open to the community, but advance RSVP is required. March 27 & April 3, 7:00-9:00 p.m.
Join our clergy team as we bring the Haggadah to life and prepare for our various family and communal seders! We will spend the first session of our time together (March 27) learning about the different elements of the Haggadah before we divide into groups and create a new Haggadah for our community during the second session (April 3). You will also walk away ready to lead your own Passover seder. We will get to know one another, while breathing new life into our Passover celebrations. Come and learn the tools to create a new Haggadah for your family and friends! Pesach, known as Passover in English, is a major Jewish spring festival, commemorating the Exodus from Egypt over 3,000 years ago. 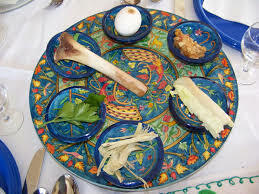 The ritual observance of this holiday centers around a special home service called the seder (meaning "order") and a festive meal; the prohibition of chametz (leaven); and the eating of matzah (an unleavened bread). On the fifteenth day of Nisan in the Hebrew calendar, Jews gather with family and friends in the evening to read from a book called the hagaddah, meaning "telling," which contains the order of prayers, rituals, readings and songs for the Passover seder. Today, the holiday is a celebration of freedom and family. See music suggestions from Cantor Gostein.